– all stuffed with various pits and pieces of fabrics (silk, linen to cotton). – sadly didn’t take a photos in full color glory as I thought it might last. Oddly I didn’t remove them straight away out of the bath, as I would normally do with food, but let them cool overnight in the bath… Remarkably they sealed the lids just fine! However the hot water bath turned a darkish Elderberry shade and my lovely reddish jars took on a new darkness – infused with elderberry I guess.. quite the disappointing unexpected surprise.. but then any dye process is a surprise. Below is the resulting photo… I’m wondering of your thoughts. 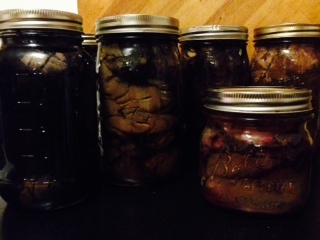 I never have had any infusion that I know of before in my food canning. But then I have never left them overnight in the bath… mind you not sure why I did that this time. 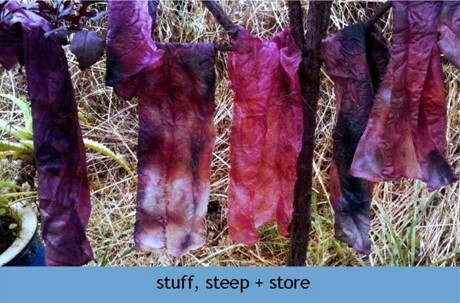 Alas, months from now it will be interesting to see if the inner bundles will have any left over reddish from the Dahlia petals place in sides the bundles and stuffings of fabric? Time will tell!